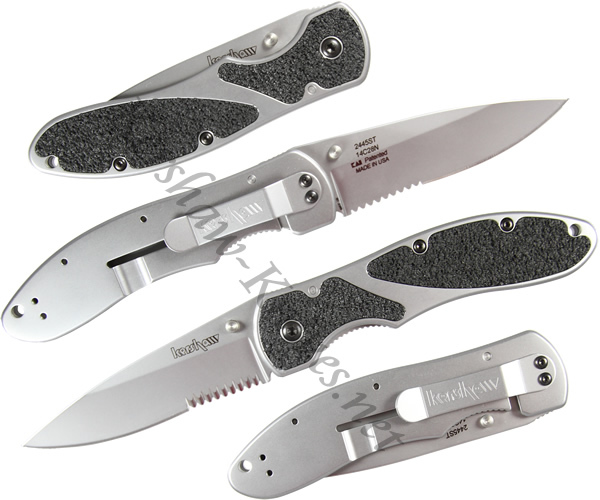 The Kershaw Salvo knife model 2445ST has a partially serrated 14C28N stainless steel blade. The handle is made from 410 stainless steel. The back of the handle is smooth, allowing the user to easily insert or remove it from their pocket. The front of the handle has TracTec inserts to provide non-slip gripping. Dual thumb studs allow easy opening for all users. The blade is secured in the open position using a frame lock. The included pocket clip keeps the Salvo Serrated 2445ST conveniently accessible.